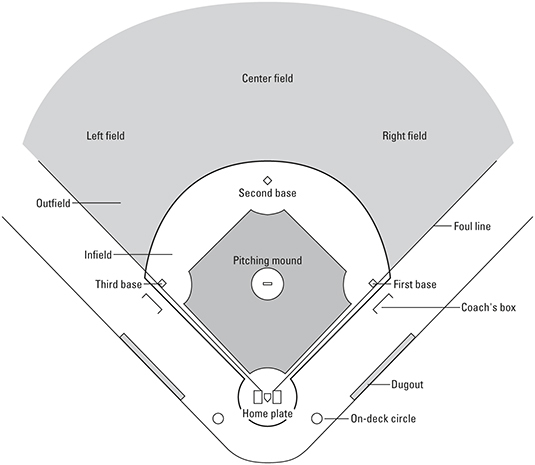 Think of this Cheat Sheet as your shortcut guide to baseball, America’s pastime, and a concise set of notes to consult about the basic rules and positions. You can quickly refer to it when you or a friend needs a quick explanation of why a certain play just happened, its circumstances, and consequences. In other words: the Situation. You’ll understand not just what the players on the field are doing, but why they’re doing it. You hit a fair ball that isn’t caught by a fielder before it touches the ground. You hit a fair ball that touches the ground and is caught by a fielder whose throw fails to beat you to a base. The umpire calls four pitches out of the strike zone during your at-bat. A pitch in the strike zone hits you without first touching your bat. The catcher obstructs your swing. You hit a fair ball beyond the playing field (for a home run). You hit a fair, catchable ball, but the fielder drops the ball, throws it away, and so on. A third strike skips past the catcher and you beat the throw to first.